The most famous radio telescope in the world is about to get a new name. The Very Large Array, known around the world, isn't what it used to be. The iconic radio telescope, known around the world through movies, documentaries, music videos, newspaper and magazine articles, advertisements, textbooks, and thousands of scientific papers, is nearing the completion of an amazing transformation. More than a decade of effort has replaced the VLA's original, 1970s-vintage electronics with modern, state-of-the-art equipment. The result is a completely new scientific facility. "The VLA Expansion Project, begun in 2000, has increased the VLA's technical capabilities by factors of as much as 8,000, and the new system allows scientists to do things they never could do before," said Fred K.Y. Lo, Director of the National Radio Astronomy Observatory. "After more than three decades on the frontiers of science, the VLA now is poised for a new era as one of the world's premier tools for meeting the challenges of 21st-Century astrophysics," he added. And so it's time, the Observatory has decided, to give this transformed scientific facility a new name to reflect its new capabilities. The Observatory is seeking ideas for a new name from the public and the scientific community. "Though the giant dish antennas, the unique machines that move them across the desert, and the buildings on New Mexico's Plains of San Agustin may appear much the same, the VLA truly has become a new and different facility. We want a name that reflects this dramatically new status," Lo said. "The new name should clearly reflect the VLA's leading role in the future of astronomy, while honoring its multitude of past achievements." Entries will be accepted until December 1, 2011, and the new name will be announced at NRAO's Town Hall at the American Astronomical Society's meeting in Austin, Texas, in January. Construction on the VLA Expansion Project began in 2001, and completion is scheduled for next year. The project replaced the 1970s-vintage electronic equipment, analog data-transmission system, and the central, special-purpose computing "heart" of the system with state-of-the-art electronics, an all-digital, high-bandwidth data-transmission system, and a new, superfast central supercomputer with an innovative design that revolutionizes scientists' ability to optimize their observations and exquisitely analyze their results. The new system is more than ten times more sensitive to faint radio emissions from distant astronomical objects than the original system, and covers more than three times more radio frequencies. The new receiving systems would be capable of detecting the weak radio signal from a cell phone at the distance of Jupiter, a half-billion miles away. The Expansion Project was funded by the National Science Foundation, and by contributions from Canada and Mexico. 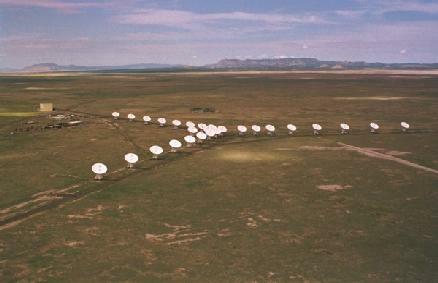 As the project progressed, the VLA began to be called the Expanded VLA or EVLA. The original VLA was authorized by Congress in 1972, and astronomers began using it for research even before its dedication in 1980. To date, more than 2,500 scientists from around the world have used the VLA for more than 13,000 observing projects spanning the range of astronomical specialties from our own Solar System to the edge of the observable Universe, billions of light-years away. More than 200 Ph.D dissertations have been based on data obtained from VLA observations.